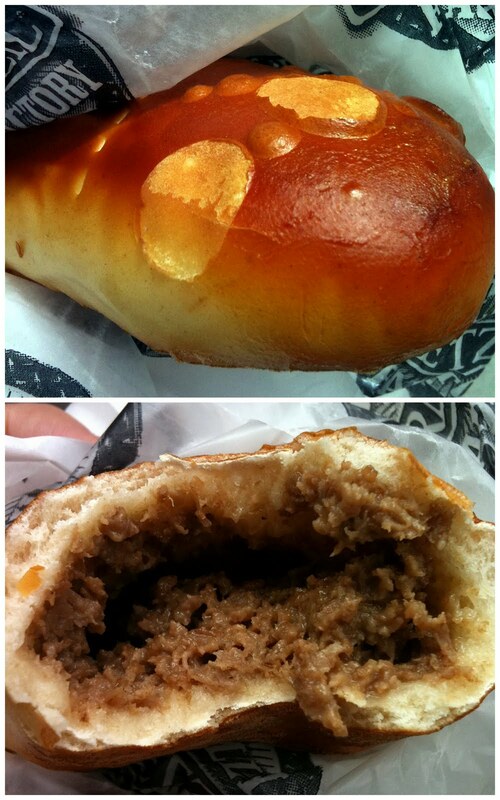 Thanks to Foobooz, I got wind that the Philly Soft Pretzel Factory was giving away free cheesesteak pretzels today. After my first bite, I realized why. It was nothing more than a glorified hot pocket. The meat inside was a grade shy of Taco Bell standards, and the "cheese" part of "cheesesteak" was neither present nor accounted for. The other realization I had was that while seemingly good on paper, a pretzel--especially a mass produced one--is the wrong vessel for delivering shreds of meat that are too good for the hot dog casing, but not quite good enough for fajitas. This meat requires the cloudlike structure of an Italian roll, not the waxy and dense just-barely-cooked doughiness of a pretzel. I appreciate the effort, but I think the pretzel should remain a lone wolf. A few grains of salt and a streak of spicy mustard is all he needs. As Will Smif (quoting someone else) once said, "If it ain't broke then don't try to fix it." Buen provecho. Philly Soft Pretzel Factory is all over the damn place. After striking out at the location on 19th and Chestnut, I went to one on 15th and Sansom. On a regular day (unless they pull the idea after failing in test markets), you can get a cheesesteak pretzel for $3.50. Oh yeah, and the first person to put a pretzel bahn mi on their menu will get a free punch in the face from me. Leave the damn pretzels alone, people.